Bored at 2.5" ID standard. Can be bored to custom sizes at an additional cost ($40 per Inner C). Need a heavy duty replacement for your bent/broken stock Dana 44 Inner C's? Or have a new steering axle build that requires a set of Inner Knuckles? Crane Axle's Dana 44 Inner C set is the perfect solution. Crane Axle's Inner C's are built out of strong 8620 Chromoly Steel that provides ultimate strength while remaining light weight. These Dana 44 Inner Knuckles are cast and machined right here in the USA. Crane Axles's Inner C Knuckles can be combined with the Interlocking Outer Knuckle Kits that Crane also provides. Being built from 8620 Chromoly Steel allows you to MIG or TIG weld these knuckles to your axle housing or axle tube. They are bored at 2.5" I.D. standard. Need a different custom bore? 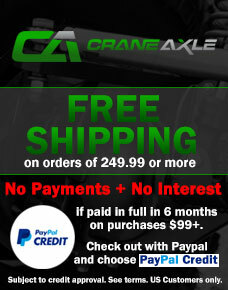 Crane Axle's Dana 44 Inner C's can be bored to custom sizes at an additional cost.